Large 8 casters are ideal for indoor and outdoor use. 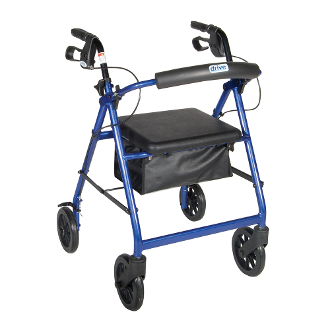 Removable hinged padded backrests can be folded up or down as necessary. Handles are adjustable in height. Easy to use loop locks. Comes with padded seat with zippered pouch under seat. Comes standard with pouch. Color: BlueWeight Capacity: 300lbs.